The Nationwide Health Information Network is making steady progress toward its goal of creating a standards-based, secure system that uses the Internet to transfer patients’ medical records. 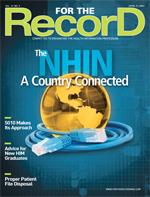 In October 2007, the public-private NHIN Cooperative was formed to lay the groundwork for a secure, interoperable nationwide health information network (NHIN). The project’s goal is to connect providers, consumers, and others to facilitate the accurate, appropriate, timely, and secure exchange of health information that follows the consumer, supports clinical decision making, and integrates public health needs. Through a nationwide “network of networks,” health information will be exchanged by diverse entities such as state and regional health information exchanges, integrated delivery systems, health plans that provide care, personally controlled health records, federal agencies, and other networks and the systems they connect. Federal interfaces to the network will be through NHIN CONNECT, a cross-agency collaboration initiated by Health and Human Services, which articulates a coherent federal strategy to enable the exchange of health information. In this effort, the Department of Defense, the VA, the Social Security Administration (SSA), the Indian Health Service, the Centers for Disease Control and Prevention, and the National Institutes of Health’s National Cancer Institute are pooling their resources to develop a set of standards-based services, along with software to connect those services to their internal electronic medical records (EMRs), or in the case of the SSA, benefits assessment workflow systems. The secure exchange of interoperable health information will facilitate the care of wounded soldiers, applications for disability benefits, and emergency response to pandemic and natural disaster victims. In March, the project achieved a milestone when the SSA became the first agency to exchange data with an NHIN partner as it began receiving medical records for some disability applicants electronically from MedVirginia, a health information exchange organization and a member of the NHIN Cooperative. The migration from paper to electronic verification is expected to decrease the time from application to determination of benefits from months to minutes, resulting in efficiencies and cost savings while improving the quality of life for those applying for Social Security disability benefits. In addition, the gateway technology was released by the federal government as an open source product. Accelerating access to Social Security benefits is just the beginning. Eventually, the gateway technology could be leveraged by 14 federal agencies and up to 10 institutes at the National Institutes of Health, avoiding the need for each agency to build its own solution. Although the electronic exchange of health information becomes complicated when it involves both federal and nongovernmental organizations, its workability has already been demonstrated at the community level. “A community-based model of care is the foundation for leveraging the value of electronic health records,” says Gary Zegiestowsky, CEO of Informatics Corporation of America, a clinical solution technology provider focused on interoperability and tools to drive quality outcomes. “In our work with metropolitan and rural health information exchanges, we have seen very significant value to be gained from providing an electronic health record across the population within a community. NHIN takes that further with the goal to span across communities toward a broad, national approach. When physicians and clinicians have electronic medical records from other facilities the patient has visited, they can spend their time more efficiently caring for patients rather than searching for data, and they can make better decisions based on complete information. Traficant has personally experienced how decision making improves with aggregate information. In the past 10 years, he has had two liver transplants and other health challenges that presented him with opportunities to view HIT at the intersection of life and data. After his first transplant, his physicians told him they could not predict if or when rejection would occur but assured him they could handle it when it did. When rejection did occur, they injected him with a drug that they said would either cure him or kill him—they would know within 20 minutes which way it would go. He survived but had another episode of rejection later and underwent the same risky treatment.